The Seattle Public Library (SPL) put out a call for comment in early September of 2015 as part of a rebranding process. The library was working with branding firm Hornall Anderson (see our previous post, “We Are An Open Book” for part of the pitch that landed them this contract). One proposed change as part of the rebranding (which was ultimately rejected) involved a name change from ‘The Seattle Public Library’ to ‘Seattle Public Libraries‘ (emphasis mine). Below, you can see three logos that were put out for public comment. Two of the logos rely on abstract geometric forms (perhaps drawing inspiration from the geometric and angular central library building), which have a vaguely organic quality, as they spread out in different directions. 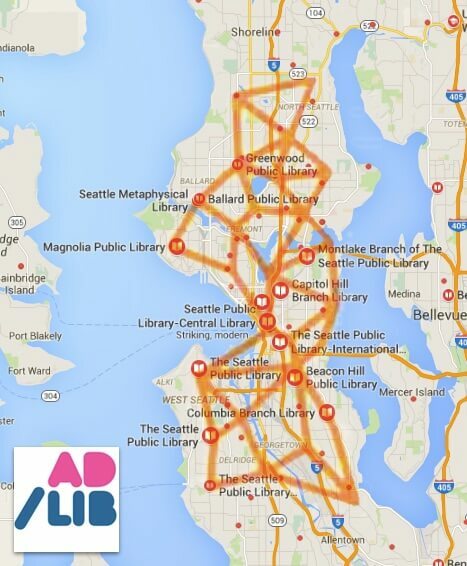 A Reddit user2 notes that the geometric form may represent a map of the library branches spread across Seattle. A map of Seattle overlaid with the geometric logo design concept for Seattle Public Libraries. Note the alignment of the line intersections with library branch locations. Adapted from an image by /u/reednak on Reddit. The third logo idea has a space-age style connective graph, which may similarly represent library branch nodes radiating away from the central branch3. All three logos use different typefaces. The emphasis in the statement is theirs. The survey also asked specifically: “Will this brand statement move us forward as an essential part of the Seattle community?”. The Seattle subreddit has some discussion about both the proposed logos and associated brand statement – the reviews are quite mixed. Judging by the commentary on Twitter, Reddit, and even local news reporting, this feedback survey has triggered a significant backlash from the public. Initially, critical reception appeared to be in response to the proposed branding itself, and why such a process was even necessary. Later, as more details were released about the associated costs, the criticisms gained in intensity. For example, Seattle’s The Stranger posted a lengthy opinion article decrying the library’s spending of upwards of a projected 2 million dollars on the rebranding effort, which, according to public documents, includes the costs to implement the brand change on signage, etc. On October 28th, 2015, the Library’s Board of Trustees voted unanimously to reject the proposed name change and logos. Discussion at the trustee meeting included expressions from six members of the public, who felt the rebranding money could be put to better use elsewhere. Board members expressed disappointment about how communication around the rebranding had been handled, which focused on the logo and name change, rather than the other substantive changes involved. The $365000 in fees to Hornall Anderson are now sunk costs, and it is unclear what else the the company will be doing for the library, if anything. There are many critical dissections of what went wrong with this process. Erica Mills of Claxon Marketing points to an over-complicated brand statement, and asking for feedback late in the process rather than early. Brian Kenney in Publishers Weekly suggests it comes down to the high costs and not properly communicating the benefits of rebranding. Library identities are always ripe fodder for designers looking to stretch their creative muscles, and The Seattle Public Library is no different, as multiple designers (or designers-in-training) have tried their hand at redesigning the logo and associated brand. Jill Hannay drew inspiration from the shape of the central library, an iconic, geometric building. This geometry is quite similar to the logos proposed by Hornall Anderson. As demonstrated below, the geometric outline lends itself to multiple, colourful permutations. Click the image to learn more about this brand concept. Hannah McCarty’s brand concept also draws heavily from the central library’s design. In this case, the building’s diamond-shaped windows formed the basis for the ‘S’, below. McCarty illustrates the design process, and includes examples of applications of branding on library cards and stationary – click the image below for more. Seattle Public Library logo concept. Image credit: Hannah McCarty. Finally, Spencer Shores’ logo concept (and associated website design) is a very minimalistic take on the same iconic building (clearly a potent inspiration), and the website has a very retro, almost ‘zine like quality. View more examples from Shores’ concept by clicking the image below. Seattle Public Library logo concept with associated website mockup (the example here is a 404 error page). Image credit: Spencer Shores.